For all of the myriad of uses for 3D printing, benefiting vastly different industries, it has been somewhat lacking in one particular area. 3D printing isn’t as sustainable as it could or perhaps should be. 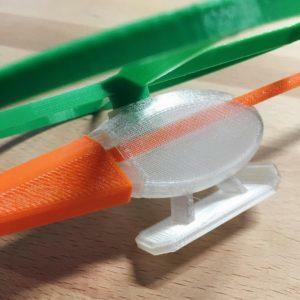 Admittedly, 3D printing can aid in reducing shipping by making products locally, allowing companies and designers to make products as needed, instead of stockpiling vast quantities of items that may never be sold. Much of the overproduction from traditional manufacturing never reaches consumers or even retail stores, but ends up in a landfill, unloved and unused. We reported on 3D Brooklyn’s early attempt to address this problem by teaming with TerraCycle to produce a recycled PP/PE blended filament made primarily from potato chip bags. Each one pound spool was made from approximately 45 potato chip bags, and they were not post-consumer trash. These were overproduced bags that had become obsolete when the potato chip manufacturer had decided to change the graphics on their packaging. There was just one tiny problem with the recycled 80% polypropylene, 20% recycled low density polyethylene blended filament: it didn’t print well. It was prone to warping and was difficult to work with. Still, it was a good start to finding a way to reduce the use of virgin plastic in FDM printing. 3D Brooklyn was undeterred in their desire to find a suitable waste material to be recycled into 3D printer filament. They found a willing partner in the Dutch design firm Better Future Factory, which was working on Refil, a recycled filament made from waste plastics. We covered Refil back in 2015. 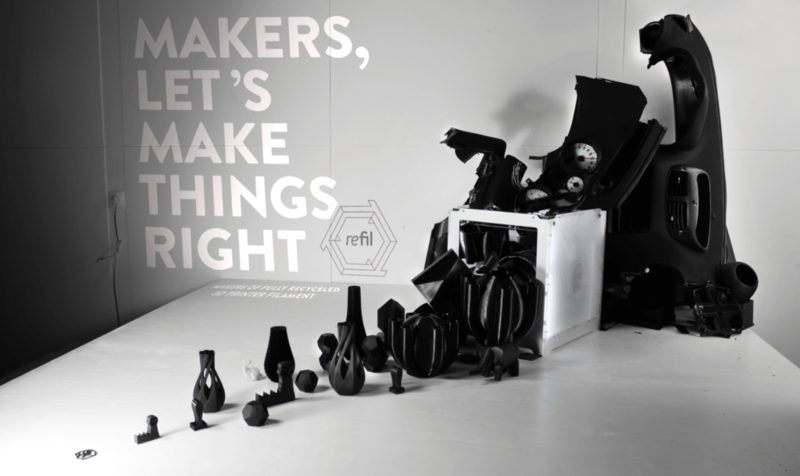 The 3D Brooklyn/Better Future Factory partnership, Refil USA, brings Better Future Factory’s high-quality recycled 3D printing filament to the US. The filament is available through 3DBrooklyn’s online store. Refil ABS is made from old car dashboards, door panels and other car plastics, while Refil PET is made from recycled plastic bottles. Refil ABS comes in black, while Refil PET comes in transparent clear, transparent natural, transparent green and transparent blue. Refil also refers to the transparent green PET as Double Green, which is made from Sprite bottles and other green plastic bottles, and their transparent blue PET is called Bottle Blue because, well, it’s primarily made from water bottles. Since Refil PET comes from bottles, it is a very clean plastic and is certified to be food contact acceptable (FCA). It also won’t smell during printing. Refil comes on cardboard spools which are 100% recyclable. 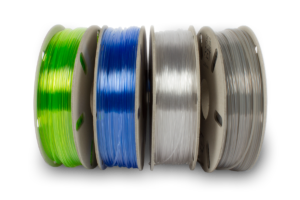 Both Refil ABS and PET come in 1 kg spools in 1.75mm and 2.85 mm diameter filament and retail for $39.99. While 3D Brooklyn is currently selling Refil that is produced in the Netherlands, they plan on producing Refil in the US, sometime in the near future. I’m really eager to try Refil for myself and it’s heartening to see just how deep Better Future Factory and 3D Brooklyn’s commitment to sustainability goes. 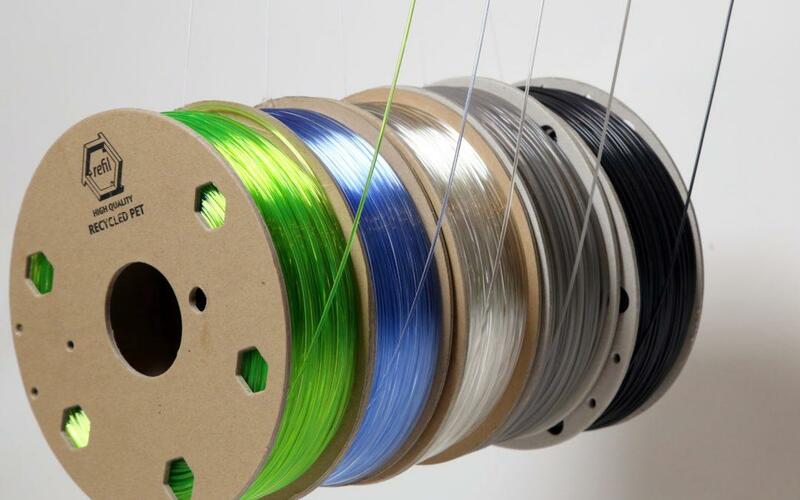 Not only are are Refil refilaments recycled and recyclable, and come on cardboard spools, but as an added bonus, the cardboard boxes for refilament have little cutouts that makers can use to advertise that their products made with Refil are ecofriendly. Pretty neat. As a designer who’s all about sustainability, that’s a very useful way to share with customers how your product stands apart from the common fare. I’ll be testing both Refil PET and ABS, so I’ll let you know what kind of results I get with it. What do you think? Are you as excited as I am to try out Refil recycled filament? Let us know in the Refil USA forum at 3DPB.com.